Pat Sloan: Is purple my color or maybe teal? There are always so many amazing photos from the trade show being shown online and at Facebook. This time I tried to get in 'more' than usual, but my time at the show was very full of meetings and working my booth. So I didn't get to walk the rows like I normally hope to. It seems the "Breakfast meeting" is the "New Black" so I was busy from sunup to sunset! I thought this was super cute and I love the girls! What drew me into this booth was the display of red/orange walls, white fur bean bags and the pink in their outfits and hair! Fantastic Display in Valori Well's booth. If you put a cute typewriter in the display I am bound to take a photo.. it's the law! 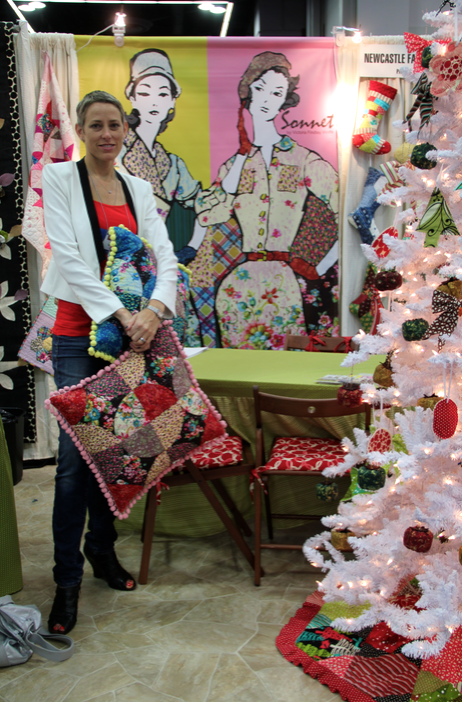 A whole lot of items in the Thermoweb booth were made in my new fabric! Every market the Moda designers that are there will get up and talk about their new line and we often have a running 'theme' thanks to the Marketing Director at Moda, Lissa Alexander! ..... skip to 15:35 to see me! Do you like me in Purple? My best friend Victoria Findlay Wolfe debuted her new fabric line for NewCastle! 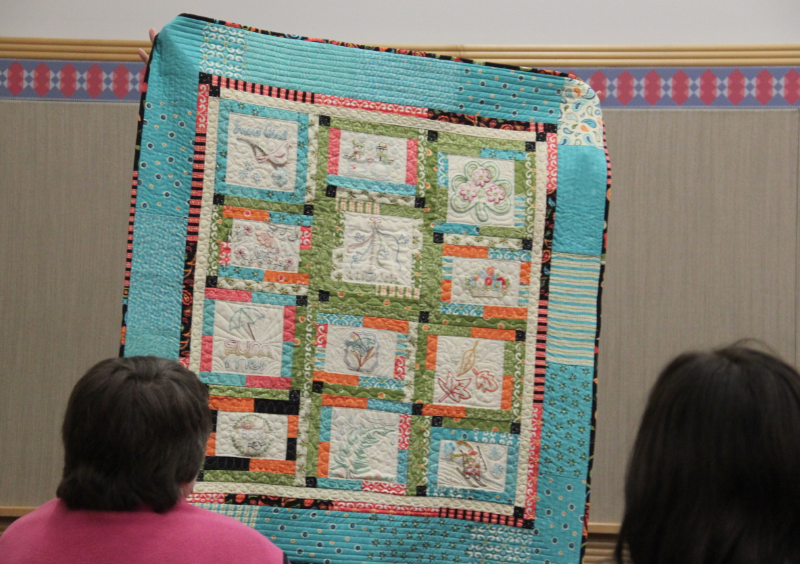 And I got the 2012 Aurifil Block of the Month all quilted!! Victoria took this photo during the schoolhouse I did. The quilt is going to Milan to the Aurifil offices. CLICK HERE and then go to the Free Pattern page for all 12 patterns and the setting! I'll do a post about it in the near future. I saw a LOT of great shades of Teal... that might be my 'New Black'.. instead of Breakfast meetings.. wink!